Twenty-four hours ago, it appeared that the Donbas separatists were about to take full control of the Donetsk airport after months of often intense fighting. There was also increasing separatist pressure on Ukrainian forces all along the line of contact, particularly in the northern part of the conflict zone, as shown below on yesterday’s map from the Ukrainian National Security and Defense Council’s press center. I have not been following military developments in the conflict zone very carefully recently, but my guess was that the separatists, with material and intelligence support from Moscow, were setting up to launch a major offensive against Ukrainian forces in the Debaltseve salient after taking the airport. I also thought there was a chance that Ukrainian forces would again be trapped in the salient, just as they had been in August in Ilovai’sk, and that they would again suffer heavy losses. 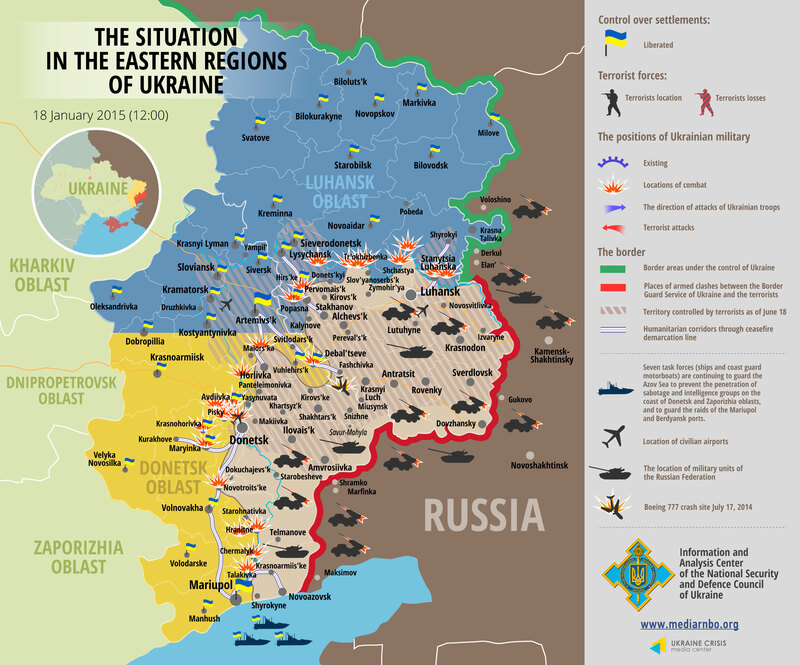 While information from the conflict zone is confused, it seems clear that the Ukrainian military launched a surprise counteroffensive yesterday and that it has managed to retake at least part of the airport. There are also reports of street fighting in Donetsk city, which if accurate could mean that Ukrainian volunteer units are exploiting opportunities to press ahead into the city or that Ukrainian military commanders have ordered regular forces into the city. The commander of the separatist forces at the airport, who goes by the nomme de guerre “Motorola” (his real name is Arseny Pavlov), has also reportedly been killed in the fighting, and the Ukrainians have apparently suffered significant tank losses in and around the airport while the separatists have suffered large personnel losses at the airport. The Russian news outlet RT has a live videocam on the approach to the airport that shows separatists’ military vehicles speeding toward the airport last night and then speeding back, which evokes memories of a rout of separatists at the airport back in June in what was the first major battlefield loss for the separatists in the current war. Finally, a bridge between the airport and downtown Donetsk has been destroyed, apparently by the separatists in an effort to make any Ukrainian assault on the city more difficult. What is not clear is (1) whether the Ukrainian counteroffensive was long planned, (2) whether it was a desperate gamble to evacuate its “cyborgs” (as the Ukrainian defenders of the airport are called by the separatists, Ukrainian fighters, and the Ukrainian and Russian media) and then cede the airport to the separatists, or (3) whether it came after the Ukrainian military felt there was a significant target of opportunity as the separatists moved forces to other parts of the front such as the Debaltseve front. Also not clear, of course, is how this battle for the airport will turn out. Nor is it clear how Moscow will react if the separatists have indeed suffered significant losses at the airport and especially if the Ukrainian military were to try to move into the city in force. I do not believe the airport is particularly important tactically at the moment, but it has become symbolically extremely important, especially to Kyiv, which was coming under growing political pressure to do whatever it could to save the cyborgs, which have been fighting fiercely for months, suffering steady losses, and slowly losing ground to the separatists. It is also strategically important in the longer run because Donetsk city is much the most important urban area for the separatists’ political plans, and governing “Novorossiya” will be impossible if Ukrainian forces control the airport and are entrenched in the northern and western suburbs of Donetsk city. There is also a chance that the runways could be repaired and serve as a landing site for Russian aviation, including but not only aircraft delivering humanitarian assistance. Kyiv appears to be signaling Moscow that it does not intend to press ahead with its offensive – it has announced that its objective is to retake the airport only. Predictably, Moscow has reacted by claiming that Kyiv has once again rejected an opportunity to reach a settlement with the separatists and that the Minsk agreement requires Kyiv to cede control of the airport to the separatists. I find that implausible – the Minsk Protocol’s implementation memorandum of September 19 provided for a withdrawal of heavy equipment from the line of control, but it required a Joint Centre for Control and Coordination to delineate the line of control, and I seriously doubt the Ukrainians ever agreed to place the airport inside the separatist zone. At any rate, to my knowledge Moscow has not offered any evidence to that effect. The reason why red flags should be going up in Western capitals is that Moscow may react by significantly ramping up its involvement in the fighting, either covertly or even overtly. I doubt that will happen if the fighting is restricted to the airport, but it is possible that Moscow will decide that the time has come to engage in a “duty to protect” operation and introduce aviation into the conflict zone, and perhaps beyond, and to otherwise take steps to inflict heavy losses on the Ukrainians. That will become more likely if Ukrainian forces try to move into the city in force, which is admittedly unlikely, But I am convinced that Moscow is going to do whatever it takes militarily to make sure the DPR and LPR do not again lose major territory to the Ukrainians.